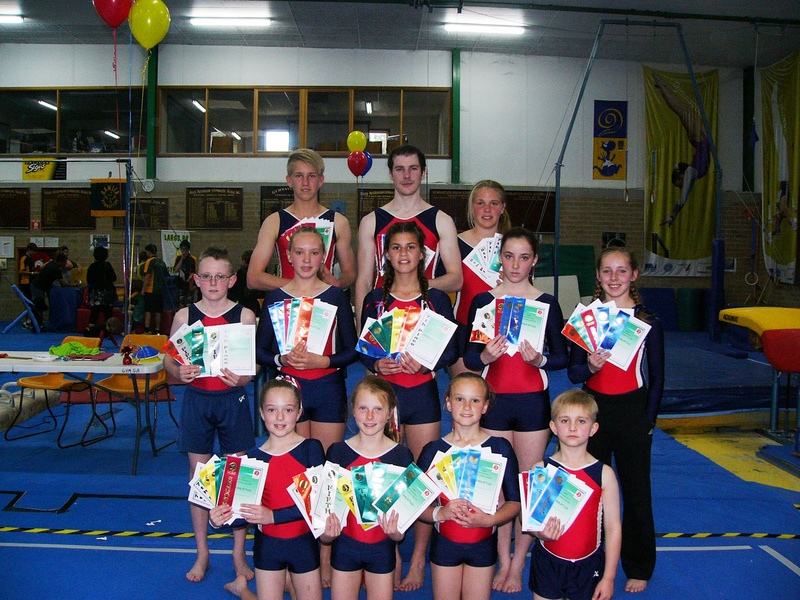 Twelve gymnasts took part this year gaining a record 81 placings. Ribbons were presented for 1st – 6th place and certificates for 1st – 10th place. Well done everyone! 1st Beam, 1st Uneven Bars, 1st Parallel Bars, 1st Trampoline, 2nd Floor, 3rd Vault, 5th Rings, 8th Mini-Tramp. 1st Floor, 1st Trampoline, 2nd Beam, 3rd Mini-Tramp, 6th Vault. 3rd Parallel Bars, 3rd Trampoline, 3rd Beam, 5th Vault, 5th Rings, 6th Floor, 7th Mini-Tramp. 1st Floor, 1st Vault, 2nd Beam, 3rd Trampoline, 6th Mini-Tramp. 1st Trampoline, 1st Rings, 3rd Parallel Bars, 4th Floor, =4th Uneven Bars, 5th Vault, 6th Beam, 6th Mini-Tramp. 2nd Rings, 3rd Vault, 3rd Floor, 4th Parallel Bars, =4th Uneven Bars, 7th Mini-Tramp, 8th Beam. 3rd Uneven Bars, 3rd Rings, =3rd Beam, 4th Trampoline, 4th Mini-Tramp, 5th Parallel Bars, 6th Vault, 8th Floor. =1st Beam, 2nd Parallel Bars, 3rd Trampoline, 3rd Mini-Tramp, 4th Rings, 6th Uneven Bars, 6th Floor, 7th Vault. 1st Parallel Bars, =1st Beam, 5th Floor, 5th Trampoline, 5th Mini-Tramp. =3rd Beam, 6th Trampoline, 7th Floor, 8th Mini-Tramp, 8th Vault. 1st Vault, 1st Floor, 1st Parallel Bars, 1st Trampoline, 1st Rings, 1st Mini-Tramp, 1st Uneven Bars, 1st Beam. 2nd Vault, 2nd Floor, 2nd Parallel Bars, 2nd Trampoline, 2nd Rings, 2nd Mini-Tramp, 2nd Uneven Bars.